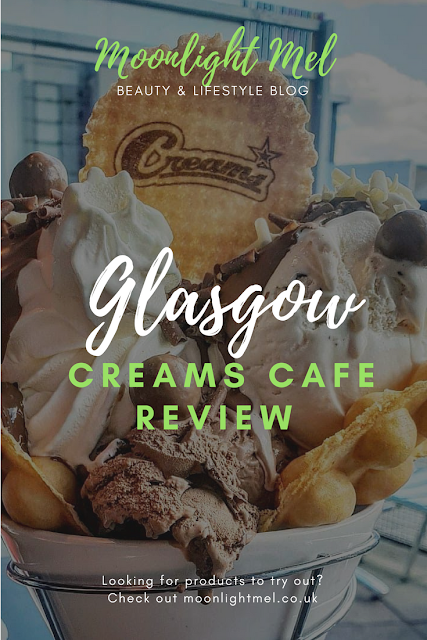 Ice cream is one of my all-time favourites treat so when I saw 'Creams Cafe' at the Quay in Glasgow I knew I had to visit. 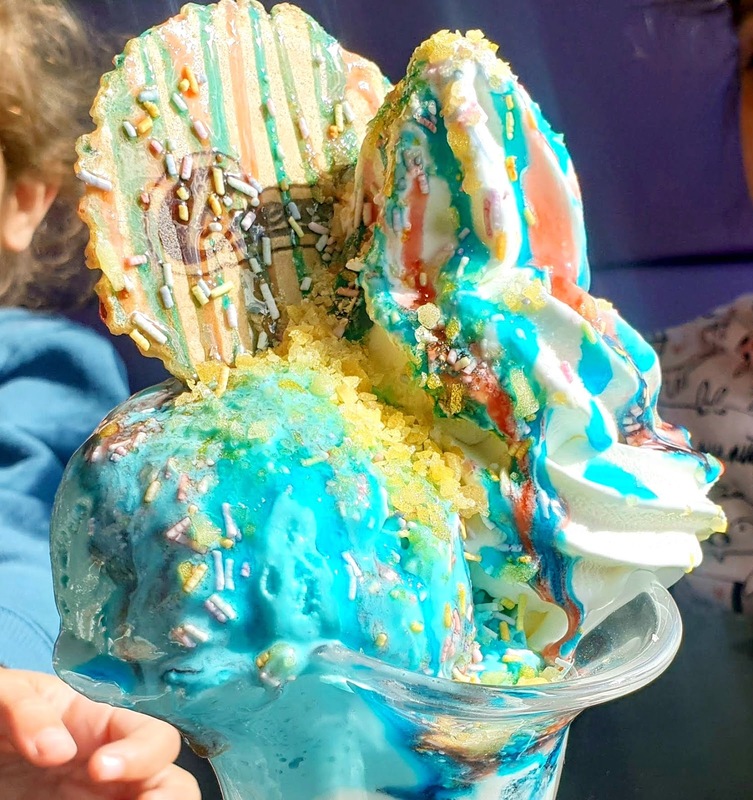 I usually got to 'What the Fudge' for my desserts but we knew we had to try out creams seeing as they have social media favourite bubble pop waffles. 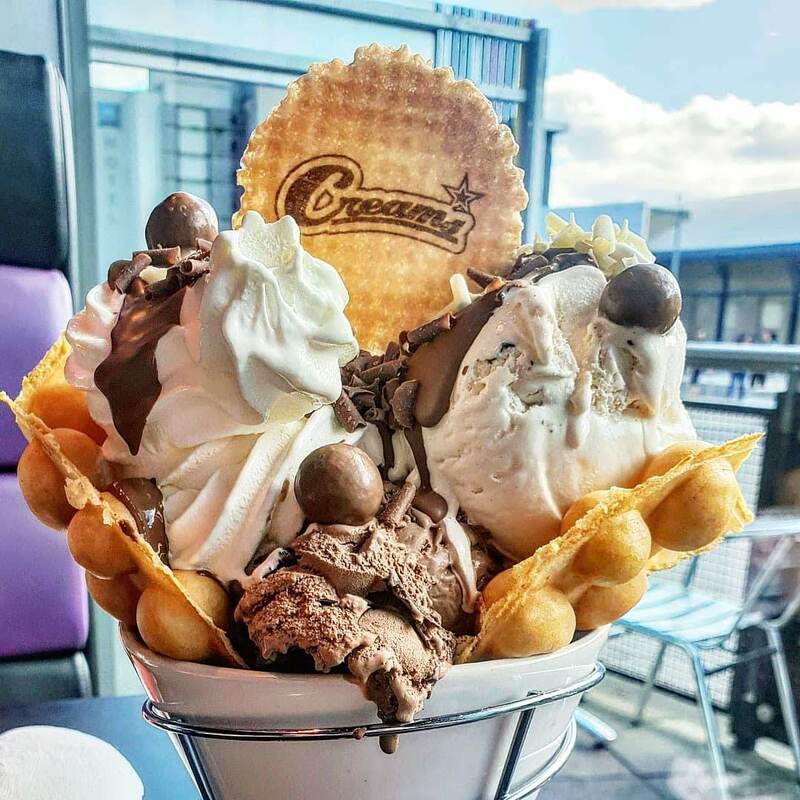 Creams Cafes are in various locations across the UK ( Glasgow in the Quay; this is the only one they have in Scotland) They sell a variety of mouth-watering desserts including; waffles, sundaes and crepes. Creams cafe was founded in 2008 and since then have gone strength to strength opening in various locations. The design of the shop is pretty cool and inside is very nice too. The decor reminds me of the Bentlys cars as the seats are designed pretty similarly especially with the stitching etc if you ask me. It has lots of seating so they shouldn't be too much of a worry on getting a seat but you can expect to queue for a little while when its the warmer weather. On the website, it is lacking for showing allergy info or even if something is vegan/vegetarian. It is definitely best to ask online or ask instore before ordering. Bubble pop waffles in Ultimate Chocolate ⭐ - This was just heaven and I would recommend it for sure. It is my favourite thing from creams cafe. It has Maltesers and choc chip gelato with soft serve vanilla ice cream. Its covered in a milk chocolate sauce that goes hard on the cold ice cream and wow it tastes delicious. To top off this is chocolate shavings, Maltesers and a creams wafer. 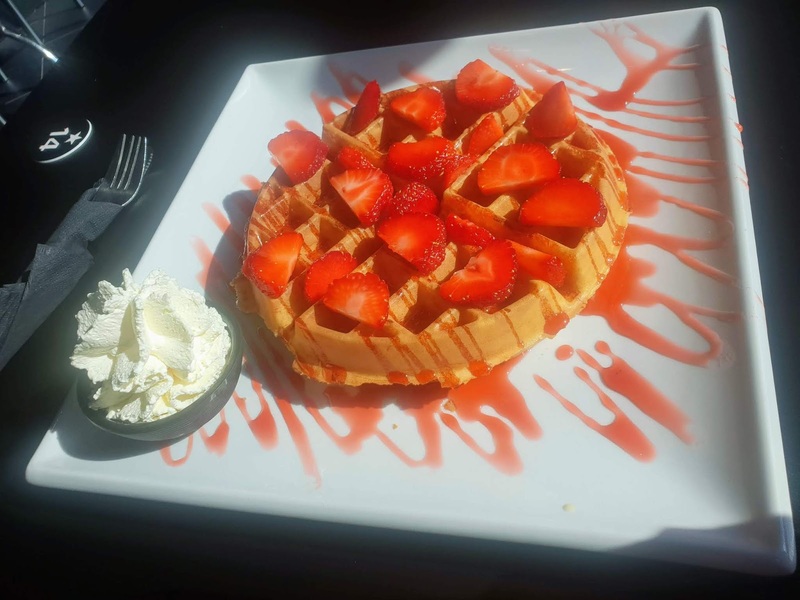 Waffles in Strawberry Choc Indulgence - This is nice and simple. It is a fluffy big American style waffle covered in fresh strawberries with milk chocolate sauce and chocolate shavings. This is super fluffy and crispy; "Yum". I have been here 3 times and each time was totally different. The first time we went with the kids it was fine and we got our desserts not too long after ordering them (10 mins) The second time was pretty much the same but the 3rd time was a bit of putting off. The staff took us to a table after about 10 mins in a queue even though plenty of seating. Getting our order was something else... I got mine after about 20 mins and my friends got theirs like 30 mins after that and their desserts were simpler than mine. I was finished when they got theirs and they also shared mine as got tired of waiting around. The taste of the things we tried is mostly good. I love how nicely the desserts are designed and the taste of the different ice cream flavours is just lovely. I do love this place and would probably go back again and just hope the last time we went was just a one-off. The desserts are really huge and if you are like me I would say they are big enough to share. We got a dessert for the kids from the kid's menu and the dessert was massive and they were no chance they could have finished it. I think the size options are little too big but they are perfect for sharing. 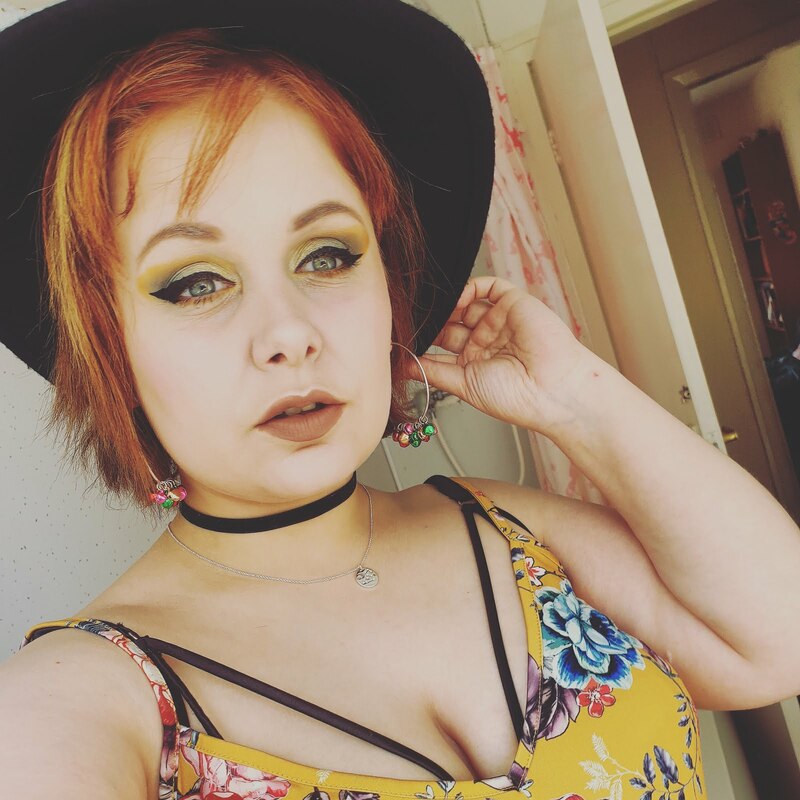 Where is your favourite place to buy desserts?